Not sure what to do with your surplus food? 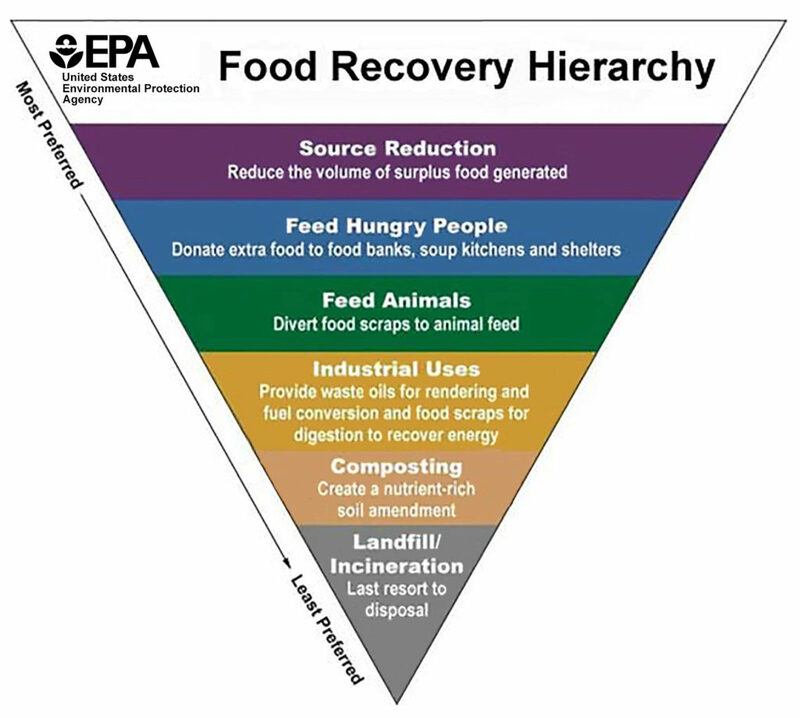 The EPA has developed a Food Recovery Hierarchy that shows how surplus, but safe and edible, food should be dealt with. We waste approximately 40% of all of our food! In addition to environmental impacts, wasting food is bad for our community because we have 50 million food-insecure people in the United States. If you have leftover food that is still good, please consider donating it to those in need. ExtraFood.Org—a Marin based nonprofit that will pick up your extra fresh food and get it to those in need right here in Marin County. SF Marin Food Bank—As one of the wealthiest counties in the country, many people assume that all Marin County residents have what they need for a healthy, productive life. Unfortunately, Marin is not immune to the struggles of food insecurity within its communities. Your help is appreciated. Cropmobster—CropMobster is an online community-based exchange system for the trade and exchange of items within the food and agricultural space. CropMobster SF Bay is focused on providing a locally based community for hunger relievers, tackle food waste and build our “farm-to-fork” economy in the San Francisco Bay Area. Do you Have Extra Harvest? FallingFruit.Org—a website that lets you post your unwanted tree fruit for others to come harvest. The map is an open source to allow for easy editing and shows fruit tree options all around the world. There are over 600,000 locations, including over 100,000 in California alone! Ample Harvest—a website that empowers you to donate your excess produce to interested local food banks and pantries. Over 6,900 are listed nationally. The Marin Open Garden Project—a website that organizes weekly meetings of backyard gardeners to exchange excess fruit, vegetables and other goodies from their gardens in Mill Valley, Novato, San Rafael and San Anselmo. The Project will harvest unwanted fruit from your garden and distribute it to other neighbors and community food banks and soup kitchens. Check out these additional resources and tips to learn how to prevent food waste.